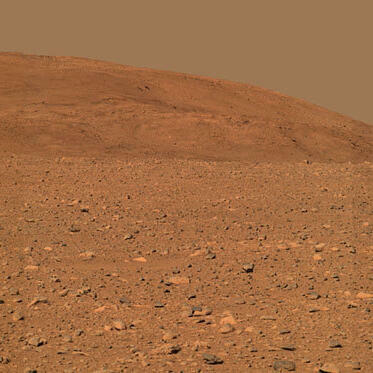 PhotoThis approximate true-color rendering of the central part of the "Columbia Hills" was made using images taken by NASA's Mars Exploration Rover Spirit panoramic camera. Scientists plan to use the science instruments on the rover to analyze the composition of rock and soil at the hills," Spirit's planned destination. The images in this mosaic, acquired on sol 149 (June 3, 2004), were taken with the camera's 600, 530, and 480 nanometer filters from three rover positions approximately 300 meters (984 feet) away from the base of the hills.